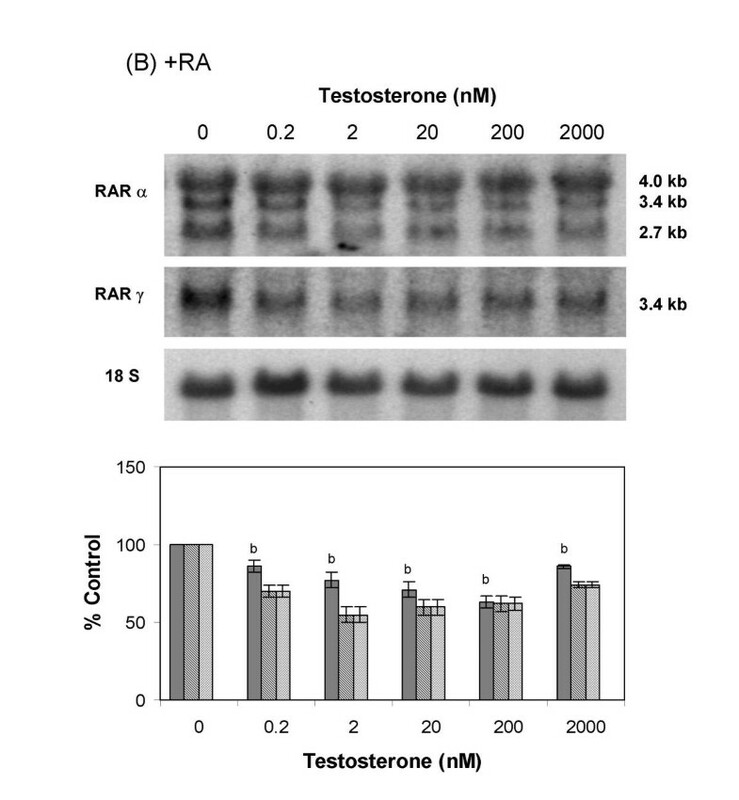 Modulation of the expression of retinoic acid receptors (RAR) α and γ in adult rat prostate by testosterone (T) suggests that RAR signaling events might mediate some of the androgen effects on prostate cells. In this study, we examined the interactions between T and retinoic acid (RA) in cell growth of human prostate carcinoma cells, LNCaP, and their relationship with the expression of RAR and epidermal growth factor receptor (EGF-R). Both T and RA, when administered alone, stimulated 3H-thymidine incorporation in LNCaP cells in a dose-dependent manner; the effect of each agent was reciprocally attenuated by the other agent. Testosterone treatment of LNCaP cells also resulted in dose dependent, biphasic increases in RAR α and γ mRNAs; increases paralleled that of 3H-thymidine incorporation and were attenuated by the presence of 100 nM RA. These results suggest a link between RAR signaling and the effect of T on LNCaP cell growth. Gel electrophoretic mobility shift assays revealed the presence of putative androgen responsive element (ARE) in the promoter region of RAR α gene, suggesting that a direct AR-DNA interaction might mediate the effects of T on RAR α gene. Furthermore, treatment of LNCaP cells with 20 nM T resulted in an increase in EGF-R. 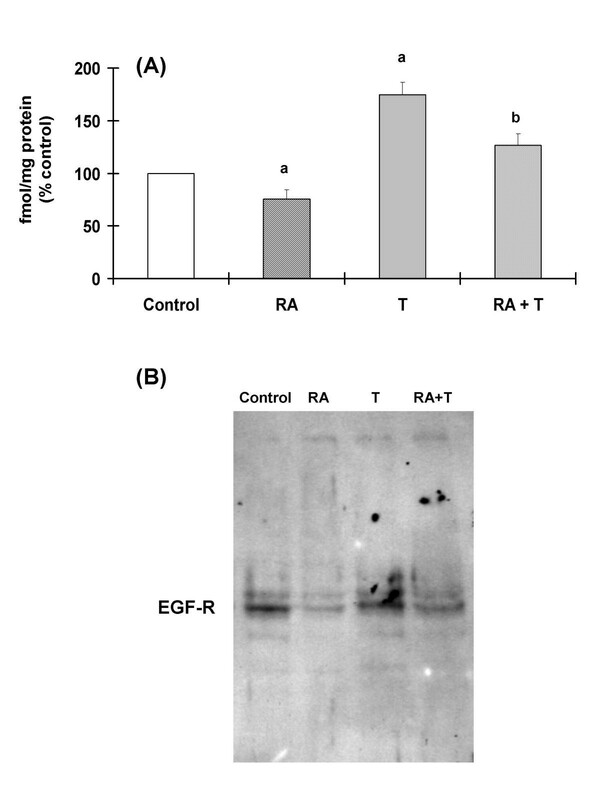 In contrast, EGF-R was suppressed by 100 nM RA that also suppressed the effect of T.
Current results demonstrate interactions between T and RA in the expression of RARs and cell growth in LNCaP cells. The presence of putative ARE in the promoter of the RAR α gene suggests that AR-DNA interaction might mediate the effects of T on RAR α gene. The opposite effects of T and RA on the expression of RAR and EGF-R suggest that signal events of these receptors might be involved in the interaction between T and RA in the control of LNCaP cell growth. Prostate cancer is one of the major diseases that pose serious health problems for aging men . It is generally believed that androgen has a significant role in the development and progress of this disease . Changes in the growth response of cancer cells to androgen ablation and anti-androgen during the progress of the disease [3–6] suggest that multiple androgen-related signaling events are involved in neoplasia and disease progression. It has also been documented that prostate epithelial cells exhibited squamous metaplastic phenotype during vitamin A deficiency , and prostate cell carcinogenesis could be prevented by retinoic acid (RA) and its analogs in vitro [8–10]. These findings suggest that retinoid-dependent cellular events were involved in tumorigenic transformation of prostate epithelial cells. Retinoic acid receptors (RARs) and retinoid X receptors (RXRs) are nuclear transcription factors that mediate the action of retinoids [11, 12]. We have demonstrated that in the rat, castration resulted in an increase in mRNAs for RAR α and γ in the prostate; such effects were prevented by T replacement . We also demonstrated that the levels of mRNAs for RAR α and γ in non-tumorigenic rat epithelial cells (NRP152) were down-regulated, whereas those in tumorigenic cells (NRP154) were unaffected or up-regulated following T treatment . In addition, RAR α was over-expressed in tumorigenic NRP154 cells. These findings suggest that tumorigenic transformation and perhaps neoplasia of prostate epithelial cells are associated with abnormal expression and androgen regulation of RARs. Androgen exerts its biologic effects by binding to and activation of androgen receptor (AR) that trans-activates target genes through androgen responsive element (ARE) in the promoter of target genes . In human breast cancer cells the effectiveness of retinoids in cell growth suppression was dictated by the presence of RAR . Estrogen regulation of the expression of RAR α was mediated by interactions between estrogen receptor (ER) and estrogen responsive element (ERE) in the promoter of RAR α gene . Because the DNA binding domains of steroid receptors including AR and ER are highly homologous, we postulated that similar mechanisms might also mediate the effect of androgen on RAR genes in prostate cells. The current experiments investigate the effects of T and its interaction with RA on cell growth and the expression of RARs in human prostate cancer cells, LNCaP. Furthermore, we present evidence to suggest that T may affect the expression of RAR α gene through direct interaction between AR and putative ARE in the promoter of RAR α gene. Because EGF and its receptor (EGF-R) are involved in prostate cell growth, and their expression can be modulated by androgen and RA [18–20], we also examined the interaction of T and RA on the expression of EGF-R.
Human prostate carcinoma cells, LNCaP (ATCC, Rockville, MD), were maintained and propagated in T25 flasks in RPMI 1640 media (GIBCO-BRL, Gaithersburg, MD) supplemented with 10% FCS (Gemini Bio-Products, Calabasas, CA), 2 mM glutamine, Fungizone (1 μg/ml) and penicillin (200 unit/ml)/ streptomycin (200 μg/ml) (referred as complete medium) in a 37°C humidified 5% CO2 incubator. Sub-confluent (80–90%) LNCaP cells propagated in T25 flasks were washed with 5 ml of plain RPMI 1640 medium and trypsinized with 5 ml trypsin/EDTA solution (GIBCO-BRL, Gaithersburg, MD). The cells were then seeded onto the 12-well plates (2–5 × 104 cells/well) in 4 ml complete media. Two days later, the cells were well attached and covered 40–50% of the surface area. At this time the FCS in the medium was replaced by charcoal-stripped FCS (cFCS, Gemini Bio-Products), and various concentrations of T and/or all trans retinoic acid (RA) were added in triplicates. Three days later, the medium was removed and the cells were incubated in 1 ml plain medium containing 3H-thymidine (0.5 μCi/ml) for an additional 4 h. After washing twice with 3 ml of plain medium, the cells were lysed with 0.2 ml of lysis buffer containing 0.1 M NaCl, 0.01 M EDTA, 0.3 M Tris-HCl (pH 8.0), 0.2 M sucrose and 0.5% SDS. DNA was extracted with phenol/chloroform/isoamyl alcohol (25:24:1) solution and precipitated with an equal volume of isopropanol. After washing with 70% ethanol, DNA was subsequently precipitated by centrifugation. The specific activity of 3H-thymidine was then determined and expressed as cpm/μg DNA. To determine the effects of T on RAR mRNA expression, LNCaP cells were propagated in 20 ml complete medium in T175 flasks, with medium change every 4th day, until the monolayers reached >90% confluence (usually 8–10 days after seeding). The FCS in the medium was then replaced by cFCS.48 h later, various concentrations of testerone were added in the absence or presence of 100 nM RA. The cells were harvested 6 h later. This time was selected based on results of preliminary experiments (data not shown). Detailed procedures for isolation of total RNA, enrichment of poly (A)+ RNA by oligo-dT cellulose chromatography and electrophoresis and Northern blotting of RNA have been described previously . The cDNA probes of mouse RAR α and RAR γ [21, 22] were isolated by agarose electrophoresis after appropriate endonucleases digestion and were radio-labeled with 32P-dCTP, using random priming kit (Boehringer-Mannheim, Indianapolis, IN). The blots were pre-hybridized in a solution containing 6-strength SSC (150 mM NaCl, 15 mM Na-citrate, pH 7.0), 0.5% SDS, 50% formamide, and 100 mg/ml denatured sperm DNA at 42°C for 2–4 h, and were hybridized overnight in the same buffer containing approximately 106 cpm/ml of radiolabeled cDNA probe. The membranes were washed in 1× SSC solution containing 0.1% SDS at 68°C for 20–30 min, followed by several changes in 0.2-strength SSC and 0.1% SDS at 68°C for 2–4 h. The radioautographs were developed after they were exposes to Kodak (Eastman Kodak, Rochster, NY) XAR-5 film for 2–10 days using an intensifying screen. The membranes were subsequently stripped and rehybridized with 32P labeled cDNA for 18S ribosomal RNA. The relative abundance of different transcripts (RAR α, 3.4 and 2.7 Kb; RAR γ, 3.4 Kb) were scanned, and area under the curve was estimated by densitometry. The result of each sample was normalized against that of the 18S ribosomal RNA in each sample. The average ratio between the mRNA and the 18 S ribosomal RNA of untreated control cells were considered 100 %, and the results for individual experimental samples in each blot were expressed as a percentage of this average. The oligo corresponding to nucleotides -100 to -59 of RAR α promoter (antisense strand: 5' TCGACTGCCCGCCCACCGACCAATCACCAGTCAGGGGCGGATCTAC 3'; sense strand: 5' CCGGGTAGATCCGCCCCTGACTGGTGATTGGTCGGTGGGCGGGCAG 3')  was synthesized by the New Jersey Medical School Molecular Resource Facility. The oligo probes were radiolabeled using the Klenow fragment of DNA polymerase and 32P-dATP. The binding between DNA and AR was determined by gel electrophoretic mobility shift assay. Purified human AR protein over-expressed in the baculovirus  or nuclear protein extracts of LNCaP cells were incubated with 2 μg polydeoxynosinic-deoxycytidylic acid and 1× binding buffer (10 mM HEPES, pH 7.5, 1 mM mercaptoethanol, 10% glycerol and 50 mM KCl) on ice for 30–60 min. After addition of 32P-labeled probe (1 ng/reaction), the mixture was incubated for an additional 30 min on ice. Non-specific competitor (5' CGCCC GGGGT CCTCA GCG 3') or excess unlabeled specific probe were added 10–15 min before adding the radioactive probe. To super-shift the AR-DNA complex, AR protein was incubated with polyclonal AR-specific antibody (CW2)  prior to the addition of the radioactive oligo probe. The reaction mixtures were electrophoresed on a 6 % non-denaturing polyacrylamide gel (acrylamide: bisacrylamide, 30: 0.8) containing 5 % glycerol at 180 V in TAE buffer (1 mM DEAE, 3.3 mM sodium acetate and 6.7 mM Tris, pH 7.5). 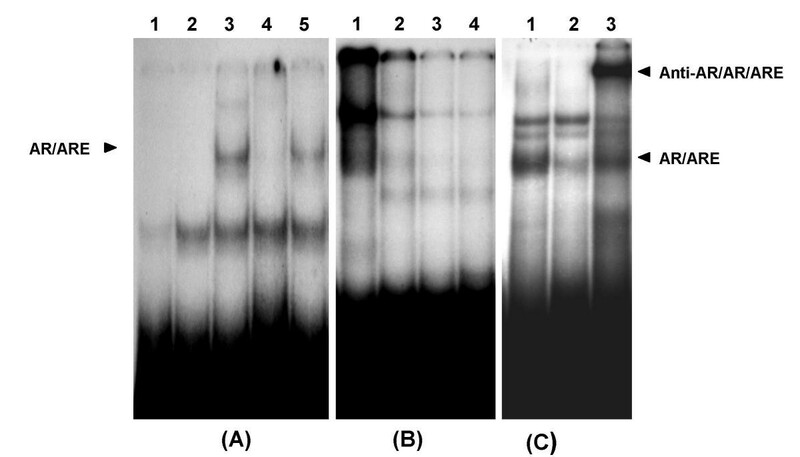 The gels were dried at 60°C and DNA/protein binding was visualized by radioautography. The same experiments were repeated at least 3 times. LNCaP cells (approximately 90% confluence) propagated in T75 flasks were treated with T (20 nM), RA (100 nM) or a combination of both in medium containing cFCS as described above for 24h. The cells were subsequently harvested for the isolation of cell membranes by the method described by Wang et al. .
Duplicates of membrane preparations equivalent to 0.1 mg protein were incubated with 125I-EGF (50 or 100 ng; Amersham Life Sciences, Arlington Heights, IL) in 200 μl reaction buffer (5 mM Tris-HCl, pH 7.0, 125 mM sucrose, 75 mM NaCl, 0.5 mM Ca2+ and 0.5% BSA) at 25°C for 60 min. Non-specific binding was obtained by adding 100× non-radioactive EGF (Sigma Biochemicals, St. Louis, MO). The reaction was stopped by addition of 1 ml ice cold washing buffer (5 mM Tris-HCl and 0.5% BSA, pH 7.0), and membrane bound (125I)EGF was precipitated immediately by centrifugation (14,000 rpm × 4 min) at 4°C. The pellets were washed with 1 ml washing buffer and re-pelleted. Specific binding was obtained by subtracting non-specific binding (in the presence of a 100-fold excess unlabeled EGF) from total binding. The results were expressed as fmol/mg protein. The cell pellets were re-suspended in 1 ml PBS, lysed by boiling and stored as 0.1 ml aliquots at -70°C. For Western blot analysis, 15 μl of samples containing 20 μg protein were mixed with equal volume of 2 × loading buffer (1X = 125 mM TRIS-HCl, pH 6.8; 2% SDS, 5% glycerol, 0.003% bromphenol blue and 1% 1-mercaptoethanol), and boiled for 5 min. Fifteen (15) μl of the samples were electrophoresed on a 7.5% SDS-polyacrylamide mini-gel for 1 h at 150 V. The proteins were transferred to a PVDF membrane (Amersham Life Sciences, Arlington Heights, IL) using a Mini Trans-blot Cell (Bio Rad Laboratories, Hercules, CA) at 50 mA. The membranes were blocked overnight at 4°C in TBST (10 mM Tris-HCl, 150 mM NaCl, 0.05% Tween; pH 8.0) containing 3% fat free dry milk. Thereafter, the membrane was incubated with a monoclonal anti-human EGF-R antibody (Oncogene Research Products, Cambridge, MA) diluted 1:10 in TBST at room temperature for 2 h. After washing in TBST for 1 h, the membrane was incubated with anti mouse IgG/peroxidase conjugate (1:8,000 in TBST) for 1 h at room temperature. The signal was enhanced by ECL Western blot detection kit (Amersham Life Sciences, Arlington Heights, IL) and exposed to Kodak X-OMAT film. The identical experiments were repeated 3 times. Analysis of variance (ANOVA) was used to detect the dose-effect of T and/or RA, using the JMP statistical software package (SAS Institute, Cary, NC). Subsequently, Dunnetts multiple-range test was used to compare the means among groups. Unpaired Student's t test was used to determine the effect of RA on the RAR mRNA responses to T.
Treatment of LNCaP cells with 0.02–2000 nM T alone for 3 days resulted in dose-dependent, biphasic stimulation of 3H-thymidine incorporation (p < 0.05; Figure 1A). While effects of 0.02 nM T was abolished by 1 and 100 nM RA (p < 0.05), the effect of higher doses of T were suppressed by all doses of RA used (p < 0.05). The extent of suppression depended on the doses of both T and RA. Specifically, 3H-thymidine uptake in cells treated with 20–2000 nM T was suppressed by the presence of 1 nM RA to an extent that was significantly lower than untreated controls (p < 0.05). Similarly, treatment of LNCaP cells with 0.01–10 nM RA alone resulted in 50–70% stimulation of 3H-thymidine uptake (p < 0.05, Figure 1B); these effects were suppressed by concomitant presence of 0.02–200 nM T (p < 0.05). Such effects became less pronounced when higher doses of RA were used. Combination of 100 and 1000 nM RA with 0.02 nM T resulted in lower 3H-thymidine uptake than those cells treated with RA alone (p < 0.05). 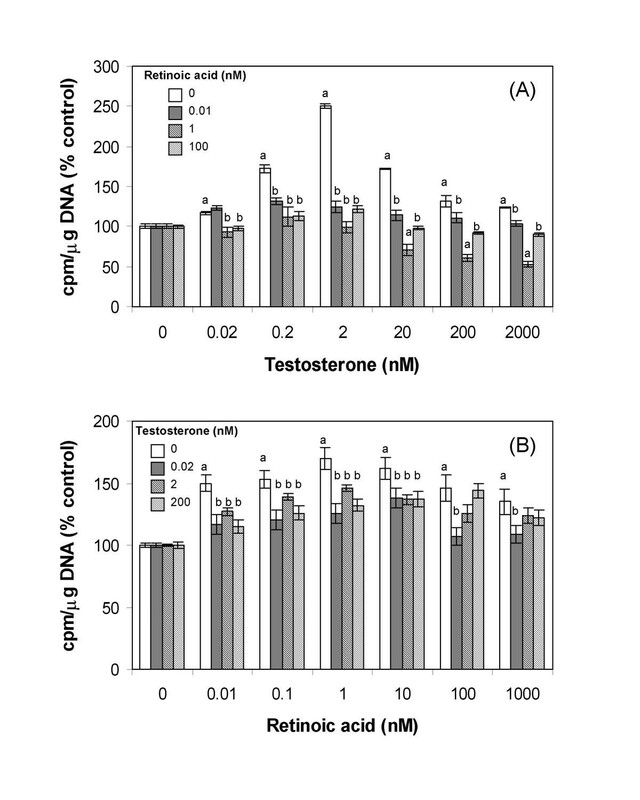 Dose effect of testosterone (A) and retinoic acid (B) on 3H-thymidine incorporation in LNCaP cells. Treatment of LNCaP cells with T alone for 6 h resulted in dose-dependent, biphasic increases in levels of RAR α and γ mRNA transcripts, with the maximal effect of 2–20 nM (P < 0.05; Figure 2). When the cells were treated with T in the presence of 100 nM RA, the RAR α and γ mRNAs in LNCaP cells were suppressed in a dose dependent manner (P < 0.05, Figure 3). The 4.0 kb RAR α mRNA was not affected by these treatments. Dose effects of testosterone on the level of mRNA for RAR α and γ in LNCaP cells in the absence of retinoic acid. Incubation of AR protein with the 32P-labeled oligo probe of RAR α promoter resulted in a protein-DNA complex after EMSA (Figure 4A); radioactivity of the complex was displaced by unlabeled oligo probe, but not by oligo probe of unrelated sequences. This complex was not present when the probe was incubated with BSA. Incubation of nuclear extracts of LNCaP cells with the 32P-oligo probe also resulted in a complex that migrated to the same distance as that achieved by AR-32P-oligo probe complex (Figure 4B). The specificity of such complex was demonstrated by displacement of radioactivity with unlabeled specific oligo probe. Incubation of AR protein with anti-AR polyclonal antibody (CW2) prior to the addition of 32P-labeled oligo probe resulted in super-shifting of the protein-DNA complex (Figure 4C). 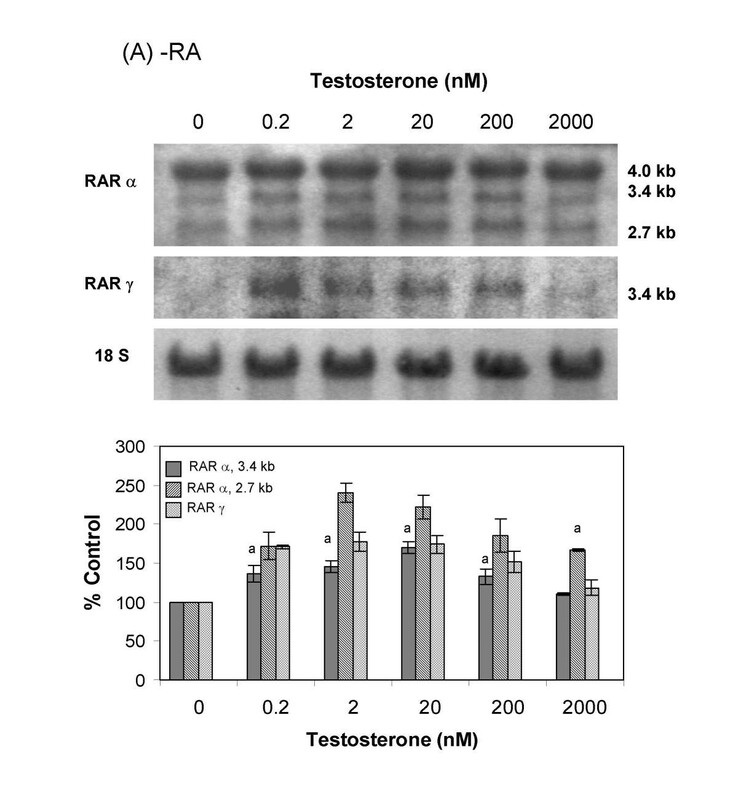 Dose effects of testosterone on the level of mRNA for RAR α and γ in LNCaP cells in the presence of 100 nM retinoic acid. Figure 5 shows that treatment of LNCaP cells with RA (100 nM) alone for 24 h resulted in > 20% decrease in the binding of 125I-EGF and membrane proteins (P < 0.05). On the other hand, binding of 125I-EGF was stimulated by 75% in cells treated with 20 nM T (P < 0.05), but this effect was attenuated by the presence of RA. Western blot analysis revealed a similar pattern of change in the 170 kd EGF-R protein. Gel electrophoretic mobility shift assay of the interaction between androgen receptor (AR) and nucleotide sequences of the promoter of RAR α gene. Panel A, 1: 32P-probe (P) alone; 2: P + BSA (10 μg); 3: P + purified AR (3 μl, 3–5 ng/μl); 4: P + AR + 500 x non-radioactive probe and 5: P + AR + 500 x non-specific oligo probe. Panel B, 1: 32P-probe (P) + 10 μg nuclear extract (NE); 2–4: P + 10 μg NE + 100x, 300x and 500x non-radioactive probe, respectively. Panel C, 1: 32P-probe (P) + AR alone; 2: P + AR + 300 x non-radioactive probe; 3: P + AR + anti-AR. The interaction of testosterone (20 nM) and retinoic acid (100 nM) on EGF-receptor in LNCaP cells. Panel A, Ligand binding; Panel B, Western blot. Androgen is essential for normal prostate function, but has also been implicated in the pathogenesis and neoplasia of prostate cancer [1, 2, 26]. On the other hand, retinoid is essential for normal prostate function [7, 27, 28] and exhibits anti-proliferative and chemopreventive efficacy in experimental prostate carcinoma [8–10]. The dose-dependent stimulation of 3H-thymidine incorporation in LNCaP cells by T and RA when administered alone, and reciprocal suppression of such effects by each other, are consistent with previous findings [29–32]. These results illustrate interactions between androgen and retinoid in the control of LNCaP cell growth. A correlation between dose effect of T on 3H-thymidine incorporation and that on RAR α and γ mRNA levels further suggests that RAR signaling events might be involved in such interaction. Stimulation of LNCaP cell growth by RAR analog  and over-expression of RAR α in tumorigenic rat prostate epithelial cells  support the above notion. Modulation of the expression of EGF and its receptor (EGF-R) in prostate cells by androgen [18, 19, 26], and over-expression of EGF-R during the advanced stages of prostate cancer , imply that EGF/EGF-R signaling events might be involved in neoplasia and perhaps progression of prostate cancer. An increase in EGF-R in LNCaP cells after treatment with growth-stimulating dose of T is consistent with this postulate. Suppression of EGF-R in LNCaP cells after treatment with a dose of RA that also attenuated the stimulating effect of T on EGF-R, further suggest that EGF-R signaling might have a role in the interaction between T and RA on LNCaP cell growth. In this regard, RA was reported to blunt the growth response of LNCaP cells to EGF . These investigators also reported increases and decreases in LNCaP cells in S-phase after exposure to growth stimulating and anti-proliferative doses of RA, respectively. Treatment of LNCaP cells with an RXR agonist also caused an increase in G1 cells and a decrease in S phase cells , suggesting that cell cycle kinetics are involved in the effects of RA/RAR signaling. Binding between AR and nucleotide sequences of the promoter of the RAR α gene and that such protein-DNA complex was super-shifted in the presence of anti-AR serum suggest the presence of ARE in RAR α gene. This notion is supported by the presence, within the oligo probe, of nucleotides sequences 5'AGATCC 3' (n-98 to -93) and 5'ACTGGT 3' (n-85 to -80) which are identical or complementary to half of the palindromic ARE motif of prostatien C3 subunit gene (5'AGTACG 3')  and that of PSA promoter (5' AGTGCT 3') , respectively. Binding between LNCaP cell nuclear extract and oligo probe of RAR α promoter thus suggests that AR-ARE interaction might mediate the effects of T on the expression of RAR α in LNCaP cells. A similar mechanism may also pertain for the effects of T on RAR γ since the DNA binding domains are highly homologous among RARs. In addition, sequences in other segments of the RAR α promoter including 5' GGGACA 3' (n -46 to -41) and 5' TCTGCT 3' (n -25 to -20) were similar or complementary to that of half site of the up-stream ARE (GGAACAtatTGTATC) and promoter ARE (AGAACAgcaAGTGCT) of PSA gene , respectively. Oligo probes containing these sequences also interacted with AR protein (data not shown). These results further suggest possible presence of multiple AREs in the RAR α gene. Functional importance of multiple AREs in androgen effects has been demonstrated in PSA gene . Stimulation of RAR α and γ mRNA in LNCaP cells by T differed from that in normal rat prostate and non-tumorigenic rat prostate epithelial cells (NRP-152), but was comparable to that in tumorigenic rat prostate epithelial cells (NRP-154)[13, 14]. In cervical carcinoma cells, the RAR β gene was abnormally down-regulated by RA . In ER positive human breast cancer cells, RAR α mRNA was also up-regulated by estrogen . Thus, T stimulation of RAR mRNAs in LNCaP cells could be related to the pathologic state of the cells. LNCaP cells contain high levels of functional AR with mutated ligand binding domain and exhibit aberrant cellular responses to androgen [5, 37, 38]. The mutated AR when interact with the ARE of the RAR-α gene, may trans-activate the gene in an abnormal fashion resulting in increases in its mRNA. In summary, current results demonstrate interactions between T and RA in the expression of RAR α and γ and EGF-R, as well as cell growth in LNCaP cells. These results suggest that RAR and EGF-R signaling events might be involved in the effects of RA and T on LNCaP cell growth. Moreover, EMSA demonstrated the presence of putative ARE on RAR α promoter, suggesting that AR (protein)-DNA interaction might be involved in the effects of T on RAR genes. While the importance of these in vitro findings for prostate cell patho-physiology in vivo must be interpreted with caution, current results nevertheless provide a molecular basis for the interaction between androgen and retinoid in LNCaP cells. Further understanding the down-stream signaling events in such interaction will provide new insights into the mechanisms underlying normal and pathologic growth of prostate cells, and will facilitate the use of retinoid analogs in the prevention or treatment of such diseases as prostate cancer. We thank Professor P. Chambon for the generous gift of RAR cDNAs and Ms. Faith Knabe for critical editorial review and suggestions. This study is supported in part by C. R. Bard Endowed Fund. Dr. Dr. Hosea F. S. Huang is a recipient of a grant from the Department of Veterans Affairs Rehabilitation Research and Development Service. Frank Richter is a recipient of a training grant (Ri 773/2-1) from Deutsche Forschungsgemeinschaft (DFG), Germany.